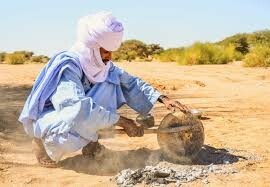 The taguella(sand bread) is the emblematic dish of the Tuaregs and also their basic food. It is served in a large dish, as a single dish or served with mutton, accompanied by goat milk, camel or ewe and tea. The term Taguella, by extension and because of its shape, refers to all the loaves. This thick baked bread, made from semolina, sometimes mixed with flour, a quart of liter of water and a good pinch of salt, kneaded for about 20 minutes and then cooked under embers, ash and sand. In a large bowl, put approximately one kilo of semolina and one tablespoon of salt, then, gradually add water. To knead this dough, which must always remain soft, it is stretched on one side and then folded (the operation is repeated on the other side). 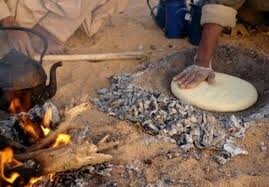 When the dough is ready, a fire is lit in a clean place covered with sand. When the fire has no more flames, and only embers remain, they are somewhat removed, so as to leave the sand of the ground uncovered, or only covered with a few ashes. In this hot sand or hot ashes a round hollow ( 4 to 5 centimeters deep), the dough (taguella)is going to be put in, and covered by the sand and the ashes . When the bread is sufficiently cooked in its upper part, the embers and the ashes are removed, the bread is turned over, and it is covered again with ashes surmounted by embers, so that the part which formerly rests on the sand cooked in its turn. An important step is to pass a piece of wood or burning branches on the surface of the cake to dry the top and prevent the sand you cover from mixing with ashes. It needs about 40 minutes to be cooked in the both sides. When it is cooked, the bread is removed from the ashes and washed with plenty of water to remove all the sand from it. It only remains to break it into small pieces while removing the pieces burnt or too hard. At this stage, it can be eaten alone or after being wet in broth (plunge in the broth then carry it to the mouth) or fragmented in a sauce made with tomato and vegetables accompanied with meat. Code trading system is so great they support me a lot in trading and making money, unlike the forex it disappoints me a lot. I will never trade back to forex again!